Can I Come and visit Wadsworth Design? Yes we have a site where most of our items can be seen. However please do book an appointment beforehand so that we can allocate some time to help you with products. Where is Wadsworth Design based? Delivery is included within the price of the goods to most of mainland UK, so there is no extra to pay other than the price listed. The following postcodes don’t qualify for free delivery, but you can contact us for a quote :IV,KW,PA,PH,DD, AB, BT and Southern Ireland. How do Wadsworth Design deliver large items? We send most of our items by pallet couriers, This is essentially like a parcel service but especially for pallets. The couriers usually work on a 2-3 day delivery service. If you place an order with Wadsworth design, we will ring you to arrange a suitable delivery day. The pallet service use vehicles with a tail lift at the back of the lorry. The lift lowers the pallet to the ground where they can maneuver it with a manual fork truck. They are only able to operate on hard surfaces such as Tarmac or Block paving drives. The cannot get the pallet over grass, gravel or up steps or curbs. If the delivery service cannot get into your drive then they will leave the pallet at the roadside for you. If you are in any doubt over delivery please contact us first before ordering. Most items are in stock and we can usually get them to you within 3 working days. 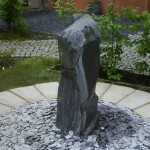 However bespoke orders and items such as engraved stone will usually take between 7-10 working days. Can I get specific sizes of rockery stone? Yes we often make crates of rockery to order and usually have a large selection in stock so please ring us with your requirements and we will do our best to get you want you need. I’m not at home to sign for the delivery, can I still receive it? If you contact us special arrangements can be made, although we prefer someone is available to sign for the goods. The delivery address needs to ensure that it has flat level ground that is of hard standing like tarmac, concrete or block paving. If there are problems and the driver fails to deliver unfortunately it will be charged for. Do wadsworth design supply trade customers?